Nine years into his NBA career, DeMar DeRozan remains one step ahead of the opposition. The Raptors star breaks down how he's become one of the most skilled bucket-getters in the league. How do superstar scorers stay one step ahead of defenses trained to their every move? In the latest episode of the Breakaway podcast, Toronto’s DeMar DeRozan speaks to the value of technique—and the wide variety of moves he draws from to keeps opponents guessing. Rob Mahoney: DeMar DeRozan is on the edge of the sun. He’s just crossed halfcourt in Phoenix, where his defender is trying to prove a point. Josh Jackson—the rookie out of Kansas—is all over him, refusing to surrender a single inch. This is a big moment for a first-year player. So Jackson edges closer, getting deep enough into DeRozan’s personal space that the All-Star guard turns to shield his dribble. Jackson mistakes that caution for weakness—so he steps up even further, oblivious to just how vulnerable that positioning makes him. The problem in guarding DeRozan is that he’s a master at creating opportunity. Just when you think you have him cornered, he sneaks loose. Sometimes it’s an explosion off that first step—a lot of the league seems to have forgotten just how athletic he is. But most of DeRozan’s options are manufactured. He’s spent years learning move upon move, building out one of the most robust skill sets in the league. DeRozan is obsessive. He’s meticulous. And the details that drive him come from this simple curiosity: He sees something in action, and he needs to know how it works. DeRozan: I think just, it goes back to watching. And being that kid that goes outside and try to do the exact moves that you've seen. And I always used to work on every—I remember I used to work on one move as a kid until I got it, and be so happy I got it, then I realized I couldn't do the other move that they did, now let me work on that. You know. And I just thought to do that with everything I seen. Just for me being a kid—not knowing, I couldn't tell you I'm doing it because I'm getting ready for the NBA or something. I was just doing it because my favorite player was doing it. You know? I remember on Space Jam, the beginning of the scene where small Michael Jordan was talking to his dad, and they was walking off. And he turned around, looked at the court, and he dribbled and took off to the court, jumping from like the free throw line, emulating that. And that was me as a kid. I just wanted to do every single thing that I seen my favorite player do. It just stuck with me. Mahoney: DeRozan’s game was born of replication. Imitate enough of those moves and you start to understand the mechanics that connect them. It’s not about pulling off one particular sequence in one particular spot. It’s taking the footwork from this piece and the sleight of hand from this one to make something that works in the moment. It’s tempting Josh Jackson closer by taking a slow dribble, all while suggesting with your shoulders that you intend to spin off to the right. Set him up once, set him up twice, and then spin in the complete opposite direction from what he expects, sending the rookie stumbling wildly out of the play. There’s nothing he can do but watch as DeRozan glides into an easy layup. And there’s only so much that can be done in general when a player like DeRozan spends his entire life working out the counter to the counter to the counter. Because technique is a vehicle. If you find the right moves and really understand them, it can take you anywhere you want to go. I’m Rob Mahoney and you’re listening to Breakaway. Mahoney: It’s the first quarter of a game against the Jazz and this Raptors possession is going nowhere. You can tell because Bebe Nogueira is posting up Rudy Gobert—something even he knows is a terrible idea. So Nogueira plays like he’s ready to throw up a running hook shot, but really he’s looking for any opportunity to bail out. DeRozan is his lifeline. Utah knows that, because this is DeMar DeRozan. He earned an All-NBA spot last season because he was one of the five highest-scoring players in the league, and because he shines in moments exactly like this one. With five seconds on the shot clock, he’s the guy you want. And that’s kind of incredible, given where DeRozan started as a basketball player. The knack for scoring has always been there, but for a long time his means to produce were dictated more by athleticism than anything else. He had the lift to rise over you, the speed to get by you. But there was also an inconsistency to DeRozan’s game back then—one he owed to a lack of alternatives. If you challenged him, his response was often to still attempt whatever shot he intended to—only now, it was more difficult. The only way around that was to make those alternatives from scratch. And the only way to make those, was to work relentlessly. DeRozan: Other people gotta be told when to go to the gym, what to work out, what to work on, what to do. For me, it was always my own self-motivation of maybe just wanting to make it out of Compton. I was like that with everything in my life. You know. And it carried over to today, to where, y'know, it's the norm. Mahoney: One reason that came so naturally to DeRozan is that he loves to tinker. There are some people who can take a thing for what it is. And then there are others, like DeRozan, who can’t help but see variables everywhere around them. The world, to him, is this malleable place—down to the most seemingly insignificant detail. DeRozan: That was my mindset, y'know, looking back, critiquing myself, seeing things that—Why didn't I do this? Why this was so hard for me to do. It could be the most small, miscellaneous thing that people may not even pay attention to. It could be the style of shoes I wear. It could be the smallest thing that changed the way you walk, the way your confidence, or the way you approach something differently. And that was my approach and I'm pretty sure it'll be my approach 'til I finish playing this game. Mahoney: So every summer, DeRozan went back into the lab. His developmental arc was never as simple as adding one key function to his game at a time. It all evolved together. The shot, the handle, the footwork—the steps DeRozan took were subtle, but holistic. Every year he came back a little bit better, until finally he was the kind of player a teammate might look for in his moment of desperation. So when Nogueira’s post-up goes awry and the ball comes to DeRozan, the threat level for that possession escalates. There’s not much time, and there’s not much space; the Jazz make sure that as soon as DeRozan touches the ball, his defender is right on top of him. If they play sound defense the rest of the way, they can at least guarantee a tough shot. But then Nogueira sneaks back into the play. He sets a screen on Alec Burks, who is guarding DeRozan, and that little bit of runway changes everything. Because even though Gobert steps in to take away any immediate shot, DeRozan uses that opening to accelerate around him. Now, it’s on both Gobert and Burks to race DeRozan to the basket. And they win—because the defender has the benefit of taking straight lines. DeRozan has to take this wide berth to get there, and when he does, he winds up stuck on the block and at the end of his rope. There’s a double team in front of him, featuring Gobert and his nine-foot-seven standing reach. There’s a shot clock on his back, showing about two seconds remaining. And there’s a baseline to his immediate right, taking away half of his range of motion. It’s about time we call this play dead. That’s 3:12, 1st quarter, November 3rd, 2017. DeMar DeR—wait, hold on. I…stand corrected. DeRozan took a hard dribble into his two defenders, more or less stacking them on top of each other. Then he pivoted off his back foot into a turnaround, fadeaway jumper. It’s one of those moves that calls out the Kobe and the Jordan comparisons—two players that DeRozan has borrowed from pretty liberally over the years. And it’s just a hard play to make. So much of shooting is muscle memory—an understanding of how, exactly, to move one’s body to get that desired result. But when you add the turn and the fade, all of a sudden you’re banking on very different mechanics. DeRozan: You've gotta have your balance and not just be turning around just to be throwing up a shot. For me, my turnaround is always understanding: Alright, I'm gonna turn around with strength, with balance, and understanding the strength I need out my legs and out my arms of understanding I'mma need to get this ball to the basket. It's not a normal shot. You're gonna need a little bit more of everything into this shot. And not feeling like somebody gonna block it. Every time I shoot a turnaround, I feel like nobody can block it. So be patient, be comfortable with it, shoot it like nobody guarding you. Mahoney: That’s one thing in practice, and another in the shadow of Gobert’s outstretched arm. But on this possession, DeRozan plays to that advice—this isn’t an unusually high-arcing shot, and nothing about it feels rushed. The only sense of urgency there comes from the moment. DeRozan lines the whole thing up while he’s hanging in the air, and exactly no one on the floor is surprised when the shot falls. Even the Raptors bench responds with what could be called “polite” applause. That seems like the way DeRozan would want it. There may be no greater compliment for a player than for the world to consider their most difficult attempts to be a foregone conclusion. There’s a pride in not only hitting shots, but hitting difficult ones. In not just being a player, but in being that player. DeRozan: I never wanted to be ordinary. I never just wanted to do one thing. I never wanted to be—as soon as you learn how to dunk and you realize everybody know how to dunk, they call you a dunker, you dislike dunking so much. You know? You try to figure out other things you wanna do and be good at that. So for me, it was never a sense of saying "I need-I need to have this." It was just always a sense of me not wanting to be like everybody else. You know, I didn't want to be regular. I didn't want to be this type of player, how everybody else play. I always try to learn and just be better so I could be different, y'know, instead of being content like a lot of people I've seen were. Mahoney: DeRozan’s game makes a different kind of sense when you see it through that lens. There’s a defiance to the way he plays. And nowhere is that more evident than in his relationship to the three-point line—that single stripe on the floor that has given him all kinds of trouble. It starts with a juxtaposition: There’s DeRozan inside the arc, where he’s a confident and ambitious scorer; and there’s DeRozan outside the arc, where something about that range turned him sheepish. Dig back through DeRozan’s playing history and you’ll see him freeze—hesitate on wide-open shots, pump fake when there’s no defender around, and really look for any way out of actually taking a three. At first that was more of a stylistic quirk. But as DeRozan improved, it became more and more of a caveat. There was this glaring asterisk on his play: Sure, he could score, but why won’t this accomplished mid-range shooter even attempt threes—much less hit them at a respectable percentage? And what made it so much worse is that as DeRozan was toiling with this one gap in his game, the rest of the league caught on to the value of the three. It came in waves—through the Mavericks and the Heat, the Spurs, the Warriors, these teams that not only racked up points through an inherently more efficient shot, but built entire offenses around the threat of it. DeRozan was a player out of his time. It’s been said that he would feel right at home in the 80s or 90s, but we don’t even need to go back that far. During the Lakers’ three-peat in the early 2000s, Kobe Bryant only shot about two threes a game—about the same number that DeRozan has averaged over the last five years of his career. The underlying criticism is valid. DeRozan not shooting threes did limit his effectiveness, and at times, it did hurt the Raptors. But this whole line of discussion is still kind of a raw deal. DeRozan is so good at his job in so many ways, but his two-point preference turned into a real story. It comes up all the time in interviews with DeRozan, to the point that he has to be tired of hearing about it. It’s a sticking point—so much so that it may have even informed some player rankings done by a few writers from an esteemed sports magazine. And because he did this one obvious thing poorly—or really, because he kind of refused to do it at all—that criticism came to define him. DeRozan: I used to wonder why. I think last year I took—I challenged it in a sense of, y'know, I could go out here and win games and shoot at a high level and average 30 points without shooting a three. What makes me less of a player than the next guy who probably just—all he could do is shoot threes? I just always used to wonder that. It used to confuse me at times. But I'm shooting more free throws, I'm shooting a higher percentage from here. Nobody's stopping me from doing this, why do I need to do that? That was always my question. So I just got to a point to where, like, just go out there. As long as you win games, whatever you do to win, that's all that matters. Mahoney: The only problem with that thinking is that efficiency is relative. DeRozan really did shoot more free throws than most and he shot a good percentage on mid-range attempts. But the extra point from making a three tips the scales. If you shoot, say, 36 on three-pointers, you’re getting the same return as someone return as a player who shoots 54% on twos. That’s not to say that a star should take all his shots from beyond the arc—just that those who refuse to take any are more likely to be left behind. So the basketball world—and even some within the Raptors organization—pushed DeRozan to build out that part of his game. And for a long time he resisted. He’s an obsessive worker, so that wasn’t really the problem. Clearly he wants the best for the team … and yet he dug in his heels on this one issue. DeRozan: For me, it was always my own self-motivation of maybe just wanting to make it out of Compton. Mahoney: That community—and all its problems—are an inextricable part of DeRozan’s story. You just don’t get this person without that background. The pride, the resolve, the stubbornness—it all traces back to that place. It’s where DeMar came into his own. And it’s where, among so many other things, he learned to play basketball. A game like this can mean something different to anyone who plays it. What kept DeMar coming back was that basketball took this kid in Compton, and it made him feel powerful. DeRozan: My passion came from just being able to feel free. And as a kid, it always gave me that element of feeling unstoppable. You know? In the sense of you watch your favorite players, and you go out there and reenact the moment of a shot that they just made. The crowd, the intensity, the boos, the pain, the happiness. Everything that comes with the game of basketball has always been the most fulfillment of joy for me. That's why I play it. Mahoney: Now imagine you play ball at a high enough level to make it out of that neighborhood against incredibly long odds. You’re recruited by top schools all across the country. You play well enough in college to be selected with a top-10 pick in the draft. And when you make it to the pros, you pretty quickly establish yourself as an effective scorer—all because of the work. You put up impressive numbers and, in time, your team does well. And then eventually, there’s this wave of pushback against the way you play. Because you’re good, but this game that gave you all this joy and all this freedom—you’re doing it wrong. You’ve seen other players win championships playing the way you do, but no, no—that’s not gonna work anymore. You need to change. Professional players are always going to be skeptical of those who tell them to do something dramatically different. And that’s why it’s to Dwane Casey’s credit, as Toronto’s head coach, that he never really did. I’m sure Casey would have loved for DeRozan to shoot threes. This year’s Raptors, after all, run their offense around creating those very shots. But Casey also made it a point to let DeRozan be himself. He worked in the post-ups. He relied on DeRozan’s mid-range proficiency. It wasn’t always perfect, but it helped establish a certain trust—the kind that could anchor a seven-year working relationship. DeRozan: So when you get that type of freedom, you know, you don't take it for granted. You want to go out there and play hard for a person who give you that type of leeway because you don't wanna lose it. You don't wanna lose that opportunity cause you look around, you see everybody don't get the same opportunity. Mahoney: The Raptors found ways to work through DeRozan’s inside-the-arc game, and in the process, honed it. DeRozan is one of those players who is a constant threat in the spaces he occupies. When he doesn’t have the lane to drive, he has the jumper. When he doesn’t have the jumper, he can usually get to his floater. There’s really a lot to work with—even if, from an optimization standpoint, it’s not quite ideal. But there’s also an understanding that DeRozan and the Raptors’ particular style had been played out to its natural conclusion. This season brought big changes. Toronto is playing faster, moving the ball more quickly, and hovering around the top five in three-point rate. DeRozan, for his part, is both creating in more dynamic ways and making a concerted effort to reshape his shot profile. He really cut back on the long two-pointers, the empty calories of NBA basketball. And proportionally speaking, he’s putting up threes at about double his career average. Even stubbornness takes its course. DeRozan: I knew eventually I was gonna do it. I just didn't know when. It was just gonna come. I look at—it goes back to a lot of my favorite players. Jordan really didn't shoot the three until later in his career. Jason Kidd didn't really shoot the three 'til later in his career and he was one of the all-time greats. It just comes with the development of your game. And with that came the frequent—just shooting the threes, whenever I'm open, taking it. And doing it comfortably like I'm doing everything else, instead of thinking and wondering why this one thing is not good enough. 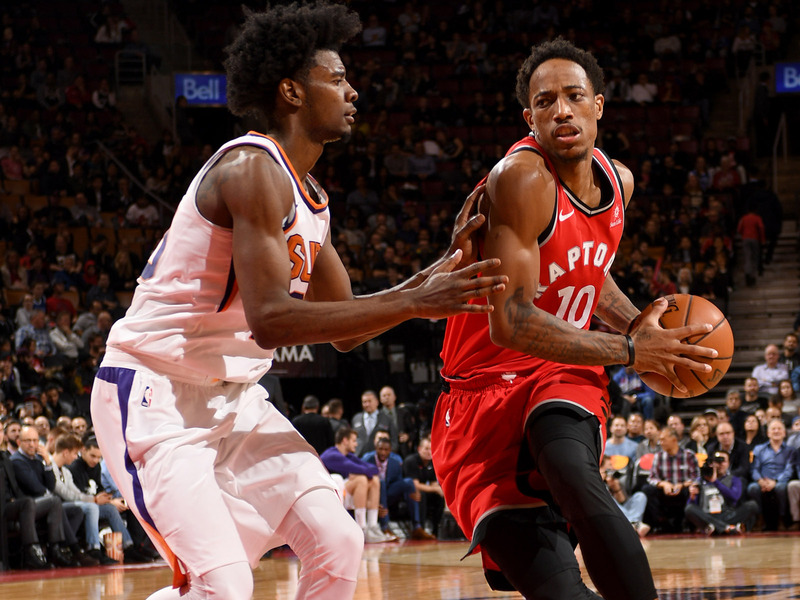 Mahoney: It’s the third quarter of a game against the Kings and DeMar DeRozan is in complete control. He stares straight through Bogdan Bogdanovic, the rookie wing who’s shuffling in front of him. This is a prime matchup for DeRozan. He ran through a pretty soft pick-and-roll a few seconds before, but DeRozan didn’t seem too concerned when Bogdanovic stuck with him on the other side. He just started the dance. The first step is a hanging crossover—the kind DeRozan uses all the time to rev up for a drive. So Bogdanovic honors it by sliding in that direction, and when he does, DeRozan immediately goes back between his legs the other way. For everything the Raptors have done to vary where DeRozan gets his touches and how he enters into plays, his role is still predicated on the idea that he can create some point of advantage against almost anyone. DeRozan has been at this for nearly a decade now, and between playing and watching he’s built an encyclopedic knowledge of the league’s personnel. But Bogdanovic is new to him. Luckily, no matter who’s guarding him—whether it’s an all-league defender or a terrible one—DeRozan starts his attack in the same place. DeRozan: You look 'em in they eye and their eyes will tell you what you're able to do. If they anxious, if they jumpy, if they concerned, if they confident. You kinda read your defender on top of knowing the work that you put in. You kinda do quick trigonometry in your head to solve the issue that's at hand and, y’know, figure it out. Mahoney: In this case, the issue at hand is relatively straightforward: DeRozan needs to beat Bogdanovic, one way or another, while minding the help defense that’s immediately behind him. Willie Cauley-Stein is just hovering there—he’s definitely not double teaming, but he isn’t closely guarding his own man, either. He’s just another obstacle that needs to be accounted for. Say DeRozan wants to set up the drive. Maybe that first crossover he pulled could have just been a hesitation instead, launching him into a hard move to his left, past Bogdanovic. Once he’s clear, DeRozan’s scoring chances are only really as good as his understanding of what happens next. Another defender is going to rotate his way—but which one? Where might they be coming from, and how quickly? Anyone talented enough can create shots to a certain point. But if you want to really drive an offense, you’ll need a firm grasp on how defenses function and a high level of situational literacy. DeRozan: You've kinda gotta put yourself in that position on both sides of the fence sometimes. Offensively, when I'm out there, that's what I do: something—I try to to master and understand rotations, coverages, personnel, time of the game, if a guy is tired, how many possessions straight we've been going, when was the last timeout, is this guy in foul trouble, is this guy having a bad day, was this guy hurt a few days ago. So many things go in a play that you gotta calculate in split seconds. DeRozan: All that goes into play. You don't need to work as hard. If you got a young player on you, you can do a move that they so worried about and just do a pump fake and get 'em in the air and get two free throws. Mahoney: DeRozan, like most players, had to build up to that level of awareness. There was a time early in his career when DeRozan was just trying to get to his spots. His game was little more than his best stuff—like a pitcher who only throws fastballs. You want that kind of heat as a foundation, but it’s not terribly useful without a few more layers. So DeRozan opened up his game with footwork. He varied his angles of attack, and he made sure his handle was tight enough to get him through traffic. He worked on reading that second level of the defense, and then attacking it, and then leveraging it by drawing fouls. These days, DeRozan is trying to take an even wider view by giving up the ball earlier in the face of pressure—a difficult bit of rewiring for a player most comfortable with the ball in his hands. Even as recently as last year’s playoffs, opponents found they could slow DeRozan by pressuring his pick-and-rolls. Bringing two defenders his way really challenged his instincts. The only way to consistently beat that kind of coverage is by passing the ball out quickly as a pressure release. But DeRozan is inclined to make plays directly—if he’s not scoring a basket himself, he looks for the assist that will lead to an immediate score. That impulse comes from the right place…but it also gives the defense exactly what it wants. When the ball stays in DeRozan’s hands even a fraction of a second too long, the momentum of a possession can go flat. That’s nothing a few film sessions and walkthroughs can’t fix, though Toronto doesn’t always have that kind of room for error. So DeRozan made those reads a priority, and the Raptors on the whole stitched that kind of passing into the fabric of their revamped offense. DeRozan: It take time. It took its time. We had a training camp, we had a preseason, and it took us awhile and then the beginning of the season to get it down pat, until we got rolling with it. So it definitely take time. It's something we constantly practice to today—understanding our options, our triggers, our ways of playing once we speed up the game and understanding where our shots coming from. So it's something that we're still getting better at. Mahoney: Moving the ball in that way is now just something Toronto aspires to do on every possession—pressure or not. And DeRozan is playing the best basketball of his career precisely because he’s learned when to let go. That he can work his way out of tight spaces or hit impossible fadeaways doesn’t mean he has to. DeRozan is embracing his alternatives. He’s averaging more than five assists a game, a personal best. And if you look at secondary assists—which is the pass leading to a pass leading to a score—DeRozan ranks in the top 15 in the league, basically tied with LeBron James. All it took to get there was some reframing. DeRozan: I love when teams blitz me, trap me because it gives us the best opportunity to score on the back side. Finding my teammates. Passing the ball. Beating a team with them trapping me is just as enjoyable as me scoring. And I understand that at this point in my career. It's one of them things of understanding where the trap coming from, where your man gonna be, where the next-best pass gonna be, and just get teams in rotations. That's another thing that comes with respect of the game. And you using that as a benefit to your teammates. You know? It's hard that not everybody get that respect and demands so much attention offensively. So with that, you've gotta use it right. Understand how to make your teammates better, understand how to make the game easier. Make the game better. Just giving your teammates that utmost confidence of: Yeah, I could get here, but I want this great shot from you. And it's been showing all year. I think that's what's making us a better team. Not just myself—Kyle been doing a great job of it. It's just that next level of understanding how to win—Show to make your teammates better and how to make yourself better. Mahoney: To circle back: All of that informs the way the Kings guard against DeRozan on this particular possession. There’s just enough movement on the weak side to keep a few of Sacramento’s defenders engaged and out of the way, for fear that DeRozan might kick the ball out for a three-pointer. And even Cauley-Stein, who was shading the play as it developed, eventually tries to float back to his man as to avoid giving up some easy look inside. That retreat leaves Bogdanovic exposed and alone. Ultimately, it’s not the crossover that gets him. It’s a single step. Because after DeRozan crosses back from his left hand to his right, he brings his left foot across as well, putting his back to Bogdanovic and the basket. And it’s at that point that Bogdanovic’s stance and positioning change completely. Because he knows what this means. In just a moment, he’ll need to absorb a bump from a stronger player while still holding his ground. And even after, he’ll need to recover to contest DeRozan’s shot, whatever it might be, without committing to it so aggressively that he fouls. There’s a brief moment where Bogdanovic’s feet shift to prepare for that move. And it’s then that the whole thing is over. Just as soon as DeRozan plants that step across his body, he counter spins the other way, seamlessly transitioning into a short jumper. He never intended to back Bogdanovic down. He only wanted to project that he might. And with that, a pretty decent defensive possession ends by giving up a completely uncontested shot from about eight feet. The vast majority of what happens in an NBA game is obfuscation. You drown your opponent in possibilities so that they can’t see through to your real intentions. If you spend a few seconds watching a player you wanna pass to or eyeing a teammate who’s planning to screen for you, the defense will pick up on it. So you mislead them. You use your movement and your eyes and your body to sell a story of how a possession could go. In this case: that a player more than comfortable on the block might look to post up against an overmatched rookie. DeRozan loves the post—in part, fittingly, because many of his peers don’t. If you look at the top 50 players in terms of post-ups per game, according to Synergy Sports, only three of them are guards or wings: Jimmy Butler, Russell Westbrook, and DeRozan. There’s a real advantage in the fact that the players who would be guarding them don’t often have a lot of practical experience in defending the post. DeRozan: You look at Alex English, he's one of the all-time greatest scorers and he kept it simple. A lot of his points came from the post-up. And I remember one day I was sitting home and I watched—I forget, it was like the '82 All-Star Game or something. Every shot that they took was like damn near in the paint. Every shot. If it wasn't a dunk, it was a little pull-up jump shot no further than than the elbow. And all these guys were so efficient at doing it. And for me, I used to wonder: Why can't I just get to this spot and shoot here? It's closer. It'd be easier. I got a good chance of making it. I just gotta get here and make it. When I was young, I was always bigger then a lot of players and I always used to post up. Y'know, I always used to hope and wish every single night when I was a kid that I would be the same size as Shaq. I used to wish that every single night. Every single night. Until I realized I wasn't gonna get no bigger, then I think with that mindset it always kept me in the mentality to post, post, post, post. Then, you know, as I got older I started to realize, you know, you watch a guy like Jordan, and you wonder how he's able to play at 40 years old. You know, he kept it simple. Post game. Andre Miller, played for a long time and he was still one of the best post-up players. You know, using the pump fake, getting to the free throw line, getting buckets, and he wasn't fast at all. This was his last couple years of his career. So for me, I always just looked at the game differently than, like, the normal person who, you know, watch a guy go out there and shoot 12 threes. So that's just always been my thought process. Mahoney: So forgive Bogdanovic for thinking that that guy—the one carrying the torch for mid-post play in the modern NBA—might actually be looking to back him in. DeRozan’s post game is in the scouting report. It’s a topic of conversation between the players who guard him and their coaches and teammates. Post work became such a prominent feature in DeRozan’s game that even though his approach has diversified, the world around him is conditioned to respect that possibility. The best thing that a go-to move can offer isn’t scoring. It’s elevation. It’s the idea that a defender might grow so consumed by one option that he neglects all the others. Mahoney: DeRozan maintains an impressive calm on the floor considering how rarely he gets a moment to himself. Some defender is always tailing him, and tonight it’s Atlanta’s Kent Bazemore—an unwavering hustle junkie with maddening length. Bazemore worked his way into the league from its fringes and never lost that scrap. Screen him once, like Serge Ibaka did, and he’ll find his way out of the jam and back into the play. Hit him with a second screen, like Jonas Valanciunas did, and Bazemore will stay just present enough to hinder another developing action. Being a top-notch scorer probably seems fun until you realize just what that honor gets you. Put up points like DeRozan does and every opponent will take you seriously. Their toughest defenders will draw your assignment. Their staff will comb through game tape looking for the tiniest weakness. That pressure can be stifling—but also kind of addicting. DeRozan: You go from being non-existent your rookie year to, y'know, being a main focal point for 48 minutes of a game from a team's best defender—or defenders. It changed the whole dynamic of the game. As a competitor, you kinda love them moments because it's—you look at it like respect. So with that respect, how can you still be able to be great if it was just a normal player on you? Now these days, you don't want just a regular defender to guard you. You know, you want the best of the best. Mahoney: Bazemore isn’t quite that, but he’s the best Atlanta has. So he gets the marquee assignment and will do everything in his power to make it work, no matter how many screens the Raptors throw his way. Giving chase around the first two served its purpose. 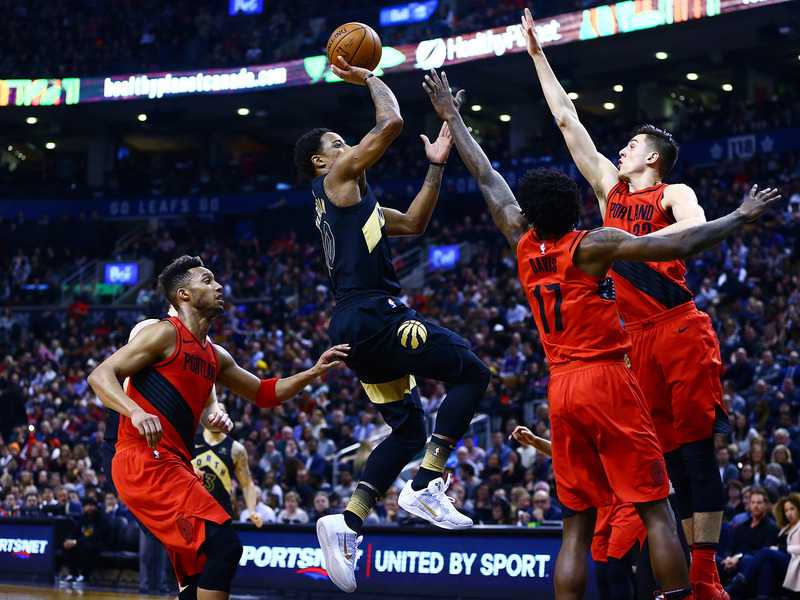 Bazemore couldn’t stop Toronto from getting DeRozan the ball, but he did push the action outside the three-point line—a step or two beyond DeRozan’s preferred range. The dust settles with DeRozan in a triple threat, buffering as his internal GPS reroutes his course. When DeRozan moves the ball to his right hand, Bazemore subtly mirrors him. And when Bazemore closes in further, DeRozan pulls back—finally putting the ball on the floor as he looks to reassert his space. The distance is its own kind of trap. DeRozan isn’t usually a threat to pull up from a few feet behind the arc, but Bazemore steps up beyond it anyway—allowing plenty of room behind him for Valanciunas and Ibaka to slide into double screening position. DeRozan snaps a crossover to his left in the hopes of catching Bazemore off-guard, but somehow he doesn’t—not really, anyway. The screen is enough to give DeRozan a favorable angle, but Bazemore somehow slithers over it, staying on his opponent’s hip with every step. Any player as technically precise as DeRozan has certain tells, and this is where he shows his: just after crossing the top of the key, DeRozan takes the kind of measured strides needed to set up a step-back jumper. A shot like that requires some mechanical precursors. Do it on a whim and the power might not be there or the timing might be off. A good step-back looks improvisational, but only because the best to do it are so smooth as to make this really challenging sequence seem that way. DeRozan: First, you gotta understand: You gotta get separation. And with that separation, it's gonna be a lot of strength you're putting into elevating into the shot. Because you're jumping kinda sideways, backwards. So you gotta get your legs really involved into it and once you shoot, shoot it with conviction. And that's one thing I always understand. If I'm gonna get this separation, I know I'm gonna get this separation but I'm kinda making the shot more difficult by jumping sideways or backwards and fading away with it. So understand the strength, understand the rhythm, understand not to feel forced when you're doing it. Mahoney: DeRozan gets that separation by jumping out to his left, but it’s clear upon landing that his stepback was only the bait. The hook is the pump fake that follows it—a hope that a bouncy athlete like Bazemore won’t be able to help himself when the ball is presented. But he does—Bazemore moves to contest the shot but stays down, clearly wary of that very fake. DeRozan, with this particular gambit, has left himself stranded. His dribble is dead, the clock is ticking down, and Bazemore is ready to contest anything. DeRozan is stuck … until somehow, he isn’t. Just when it looks as though the Raptors might have to scramble, DeRozan throws up another pump fake—this time with a more exaggerated performance. His whole body coils as if ready to launch and, for some reason, Bazemore buys it. Never mind that DeRozan didn’t have the positioning or the angle to actually take that shot. Sometimes, talented offensive players can make defenders do ridiculous things. The depth of DeRozan’s game makes him particularly great at this. One of his scoring attempts might already string together an effective move followed by multiple counters. By the time a defender finally catches up to him, their panic might override their restraint. 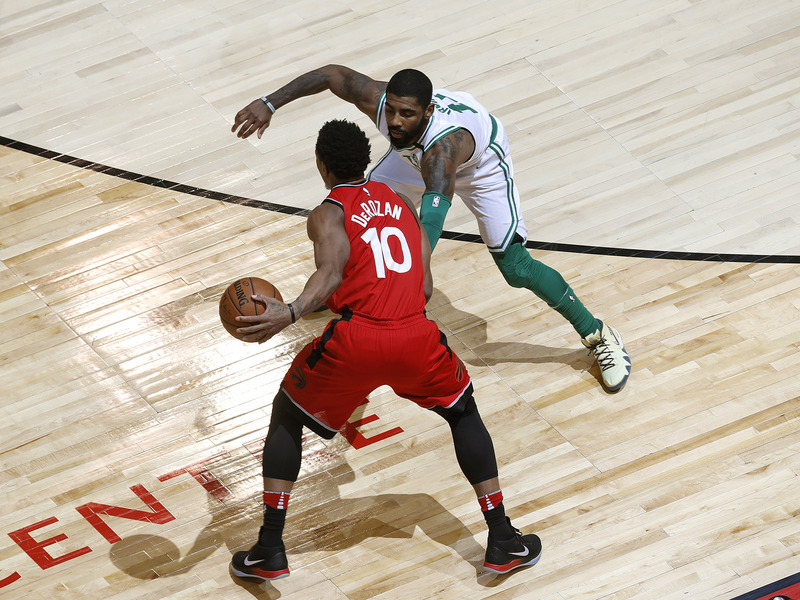 DeRozan: Understanding, y'know, sometimes you can get to a spot and the defender is worried about you getting to your spot because they know it's a good chance that you make it. So with that, you kinda get a feel of, of how you're being guarded. And you get to that spot, and you know they're gonna try their best to recover, use the pump fake. If you got a roll and you done hit three, four, five shots, guy definitely gonna be antsy to contest a shot. Use the pump fake. If you get in under the basket, a guy is trailing you, use the pump fake. You know, it's so many ways in the game of the rhythm of the game where you can be able to feel and understand when you can use a pump fake. Mahoney: This time, DeRozan isn’t interested in drawing a foul. Bazemore’s leap gives him room to slide out of the way, clearing all the airspace he needs to launch up a clean look. A single step—or in this case, a single pivot—can completely change the geometry of a play. So with a deft touch and a soft fade, DeRozan guides home a short jumper—redeeming a possession that had no right to end this well. An escape artist like DeRozan can only be as creative as his tools allow. To even reach a result like this requires a mastery of his immediate space—a grasp of how to angle his shot fake just right and what options his pivot provides. Then he computes his best course and takes it, compounding variables as he goes. To game out those possibilities, DeRozan watches all the basketball he can and takes the action itself as a prompt. DeRozan: I just love it in the sense of every time you watch it, there's so much you can learn from it. So much you could—'Man, what you would've did in this moment? Oh, they did this in this moment? Ah, I didn't think of that. Now I could think of this.' It's so much you can learn from the game. Mahoney: And there’s always something new to try. Maybe it’s the way his feet lock into position on the catch, or a situation to reverse pivot that might catch his defender off-guard. It could be a point of connection that threads one move into another. Whatever we see from DeRozan is at least a level beyond that. Raptors games are a place only for his more refined experiments—those ready to be presented for peer review. The real research comes long before. DeRozan: I think that’s where the summer comes into play. The summer is so important. Especially for me—I play all summer, whether it's pick-up, whether it's with my cousins, whether it's the Drew League. So you have so many opportunities to where you-you-you able to do all these things you work on freely without having any consequences like you would in a real game, in an NBA game. Cause if you mess up, you don't wanna turn the ball over, you don't wanna look crazy, you don't wanna get taken out the game. So all summer, the same thing that you see—you do it over and over, cause you don't worry about messing up. You don't care about messing up. And having three, four months to be able to do that, you realize you get good at it and it carries over to, y'know, rather if it's a couple possessions in the game during the NBA season, but it's natural. Instead of something that's being forced. And I think, y'know, every move that I always made and everything I did, it was never forced because I worked on it in game speed or some type of way during the summertime. Mahoney: It shows. Because the moves matter—but they’re not the only thing that does. The NBA is home to the most athletic and physically coordinated people on the planet. Lots of them have figured out what makes a good turnaround jumper. What separates DeRozan is a sort of heightened consciousness—a technical understanding so nuanced that his every move builds. Basketball, from his view, is an endless series of puzzles. And the only thing he seems to enjoy more than solving them is to be confounded.